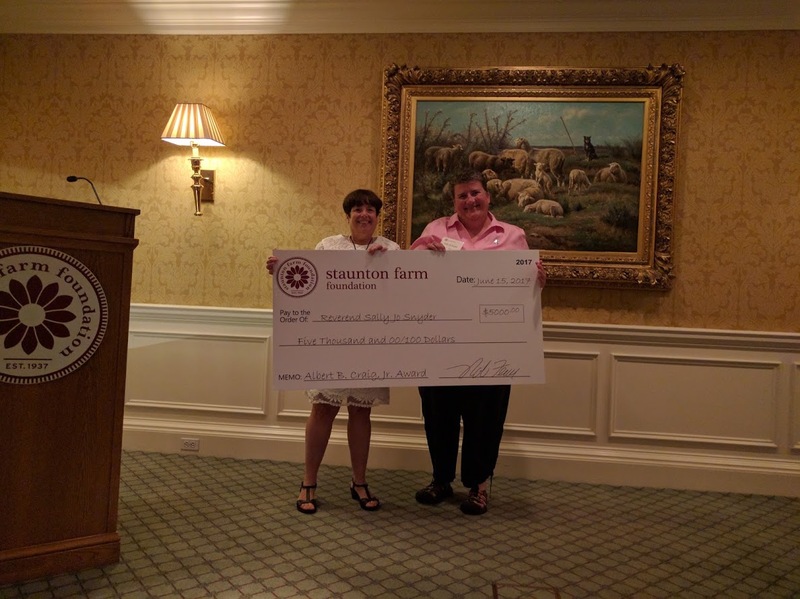 (June 24, 2017) The Staunton Farm Foundation’s President, Rob Ferree, announced on Thursday, June 18, 2017, that the Foundation has chosen Reverend Sally Jo Snyder, recipient of the Albert B. Craig, Jr. Award for Innovation in Behavioral Health. For the past thirteen years, Reverend Snyder has worked in justice ministry settings as a community organizer on local, state and national levels. Of particular concern to Rev. Snyder are issues which impact marginalized populations, children, the impoverished, members of the LGBTQ community and people with disabilities. Since March of 2007, Snyder has been on staff of the Consumer Health Coalition where she is the Director of Advocacy and Consumer Engagement. She created and leads advocacy events for rights, resources, room, and respect for persons with all types of disabilities (physical, mental, sensory, and developmental, cross). Snyder leads advocacy trainings and education events for diverse populations and seeks to empower and involve individuals in both self and systemic advocacy. Rev. Snyder was appointed to and serves as the Vice-Chairperson for the Pennsylvania Governor’s Advisory Committee for People with Disabilities and is chairperson of the Health Workgroup. It is a privilege to be associated with Sally Jo and her accomplishments.” said Ferree. The Staunton Farm Foundation’s award is named in honor of Albert B. Craig, Jr., MD of Rochester, NY. Dr. Craig, who died in 2007, served as the chairman of the Board of Trustees of the Staunton Farm Foundation and was a Professor of Physiology and Pharmacology at the University of Rochester Medical School. The award is made annually and includes a $5,000 cash prize. The person nominated need not live in this region, but their innovation must have impacted people in Southwestern Pennsylvania.